Unsolicited mass texts aren't just for political season anymore. Cell phones were hit with text messages about the potential Denver teacher's strike. 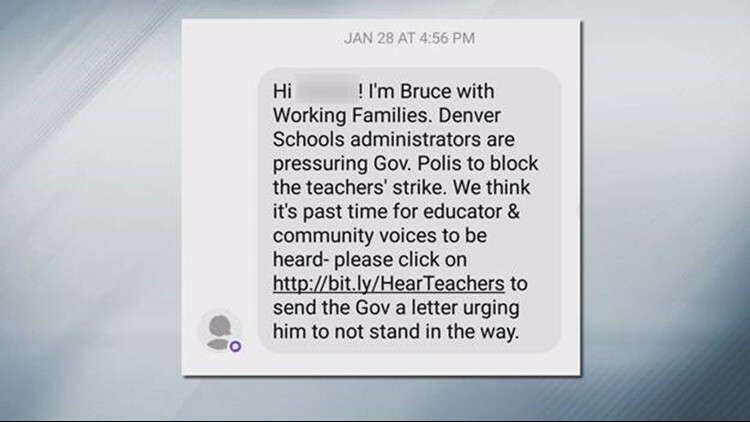 DENVER — Dueling text messages are hitting Denver cell phones about the potential Denver Public Schools teachers strike. In the last week, two groups have sent text messages to thousands of cell phones in the Denver area. The link took you to a website where you would need to put in your name, email and address before being taken to a section where you could email Gov. Jared Polis (D-Colorado). The link took you to a site where you also had to provide your name, email and address before being directed to a page where you could send a form letter or write your own message to the Governor and the seven Denver Public School board members. The thing is "Support Students, Support Families" doesn't exist. The text was really sent from Democrats for Education Reform, which is also known as DFER, which has been known to clash with teachers' unions. According to Colorado DFER executive director Jen Walmer, the text was sent to thousands of Denver residents. "We didn't target any particular group or groups," she said in an email. The list of cell phone numbers can from a "progressive data firm similar to the firms, or likely the same firm, that is used by other political campaigns, advocacy groups, political action committee, non-profits, and other political and marketing agencies that communicate directly with residents and constituents," said Walmer. The text didn't say it came from DFER. Why? "DFER is the name of our national (political action committee) and how we are generally known, but in this case the DFER PAC was not the source of funding for this effort. As this was not a political campaign it was and is not appropriate to brand our text messages as coming from DFER," said Walmer. Follow up questions from Next with Kyle Clark asking who paid for the text campaign, and if the list was bought from a third-party, had not been answered as of 6:30 p.m. Monday. "There is a big difference between what is legally required and what is ethically required. And at the end of the day, we certainly always put our names on things that we do and make it very clear who's doing things when we do them," said Colorado Working Families Deputy Director Wendy Howell. 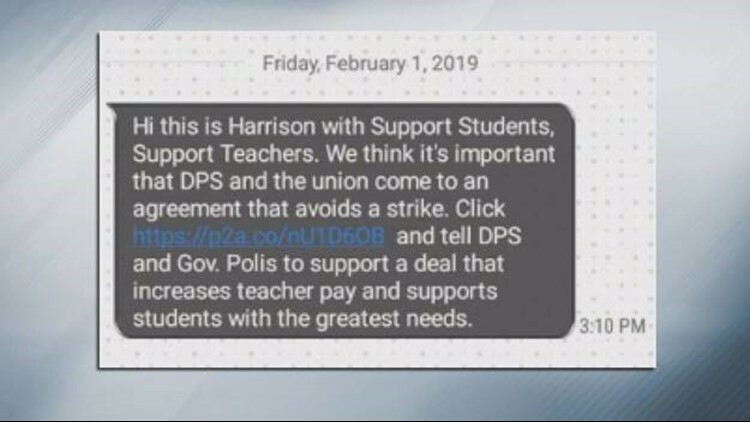 Howell was responsible for the other text encouraging people to tell the Governor from getting in the way of a teacher strike. "We don't buy lists. We sent it to our members and other politically active folks in Denver," said Howell. "We sent it to about 6,000 people. We have no way of knowing whether they were students or teachers or anything like that. We sent it to 6,000 people who were in Denver, so they were in the district, but we don't know about their relationship to the schools." As Next has covered in previous mass textodus situations, the Federal Communications Commission is OK with these types of texts as long as they are not done through an auto-dialer. A person typing a message into a computer program that sends out the text using a spoofed phone number is legal. "If no harm is intended or caused, spoofing is not illegal," an FCC spokesman told Next in June. Made for the sole purpose of conducting political polls or soliciting the expression of opinions, ideas, or votes.